Zenith was founded in 1865 but started making clocks about 1900. 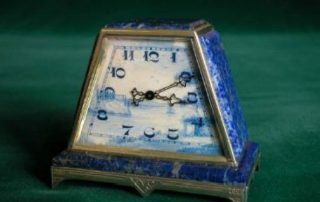 Amongst other types they produced a range of small clocks based on a diecast movement. These were often in small square cases originally housed in a fitted leatherette case. Over time the diecast material can breakdown especially the threaded bosses. This example is quite unusual. Its case is a gilded sterling silver frame and hinged back of trapezoidal shape. The top, sides and base are solid lapis lazuli panels. It is housed in a fitted outer case. The trapezium shaped dial has a painted scene with most ornate skeletal hands. The movement is an 8 day 15j. time only, wound and set with a large knob behind the rear door. The serial number is 2164666 dating it 1918. It is worth noting that the glass is trapezium shaped and convex.